SARAH ELIZA: School Survival: Stationary Essentials. So when I go to school, I don't tend to pack light- I make sure I have everything I need! I definitely pack a notebook just in case I need to take notes for anything other than what I'm supposed to. I also take another notebook which I use for my blog ideas; I always think of new blog post ideas or playlist ideas at the most inconvenient of times and by the time I get home that idea will have left my mind so it's best to quickly scribble my ideas down on the go. Especially in the first few weeks of school, teacher's are forever asking you to cut and stick sheets left right and centre so instead of having to wait for the teacher to supply you with a glue stick and scissors, you could of easily finished before they'd even given you them if you brought your own! The obvious ones are pens and pencils because you can't get a through day of lessons without having a pen or a pencil!Highlighters come in handy aswell! You are forever having to highlight a lot and when you're not using it for the right purpose you can doodle all over your arm. A ruler and a rubber- I don't really need to say such more on that! Finally, a set of colouring pencils; I always find it nice to look through my books when revising and see a little bit of colour just, maybe, underlining my titles as when it comes to revising you can easily see the different titles. Who doesn't like a bit of colour!? 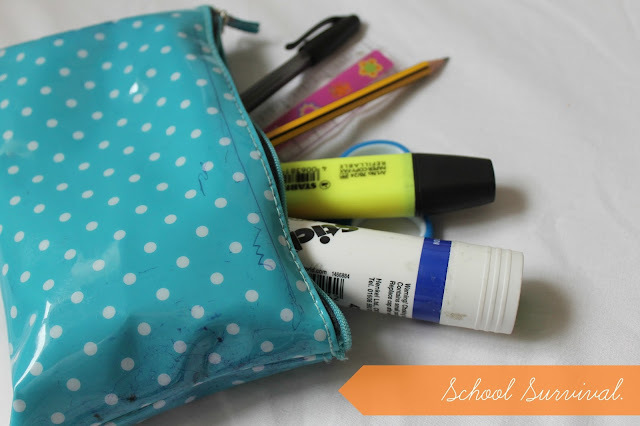 There is obviously a lot of other essentials that you probably would take to school so maybe leave them in the comments below! The Next part to this mini series will be up on Wednesday so keep a look out!